An under-the-hood power issue with the Surface Dock, a USB-C port, and the Surface Book 2 charger is the only flaw in Microsoft's new convertible tablet laptop. Editor's Note: We've updated this Surface Book 2 review on Nov. 27 after reflecting on the Surface Book 2 power problem we discovered recently. We've left our review score unchanged, and we'll discuss why later on. Microsoft’s Surface Book 2 solves a big problem for Microsoft: How do you market the Surface Book as a performance notebook when it’s two years out of date? As our review shows, by making it bigger and faster, with longer battery life. Only a power problem slows it down. With the Surface Book 2, Microsoft brings 8th-generation Intel Core processors and powerful, discrete Nvidia GPUs with enough horsepower to start thinking of the Surface Book 2 as a graphics workstation. But Microsoft’s big October surprise was the debut of not one, but two Surface Book 2 devices: a 13.5-inch and a new 15-inch model (we reviewed the latter). Neither is a simple clamshell notebook, though calling them convertible 2-in-1s instead seems like we’re selling them short. As our review of the 15-inch Surface Book 2 shows, however, the new generation isn’t perfect. An ambitious decision to use a USB-C port has ripple effects for expansion capabilities. There's a power issue. And then there’s the price: up to almost $3,300! Should you buy it? Yes, there's reason to look elsewhere. But none of its flaws are deal-breakers. 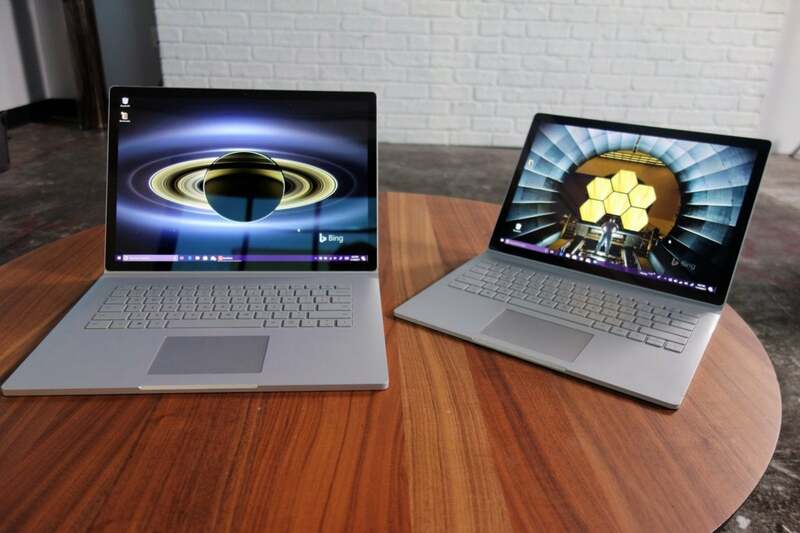 The 15-inch Surface Book 2 (left) sits next to the original 13.5-inch Surface Book, which otherwise looks nearly identical. With a name like “Surface Laptop,” you’d think that the Laptop, not the Book, would be Microsoft’s flagship notebook. It’s not. 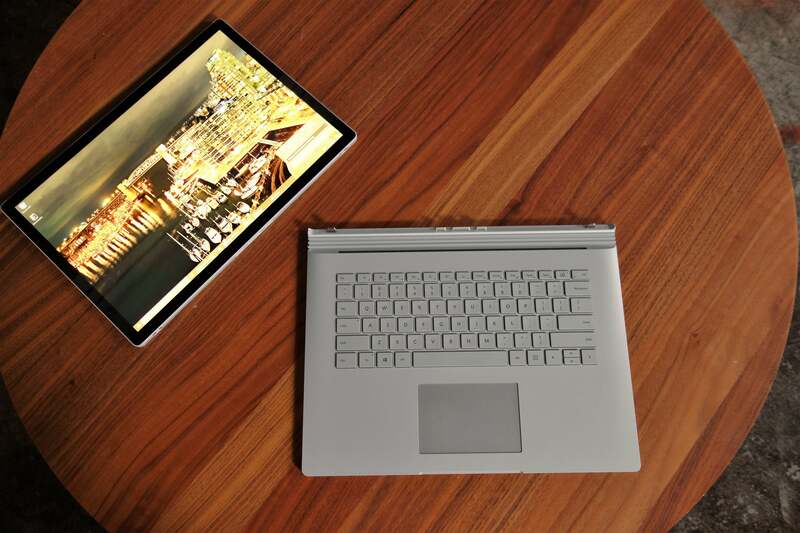 I very rarely ever undocked either the first- or second-generation Surface Book, and the combination of a sturdy construction, full-sized ports, terrific battery life, and excellent performance makes the Surface Book 2 the undisputed star of Microsoft’s mobile lineup. Compare it to Apple’s MacBook Pro, if you’d like: On paper, the Surface Book 2 tops it. If you already own a Surface Book, you know what the Surface Book 2 looks like: It’s virtually identical. But now it has a bigger sibling, as the Surface Book 2 ships in either a 13.5-inch or a 15-inch form factor. 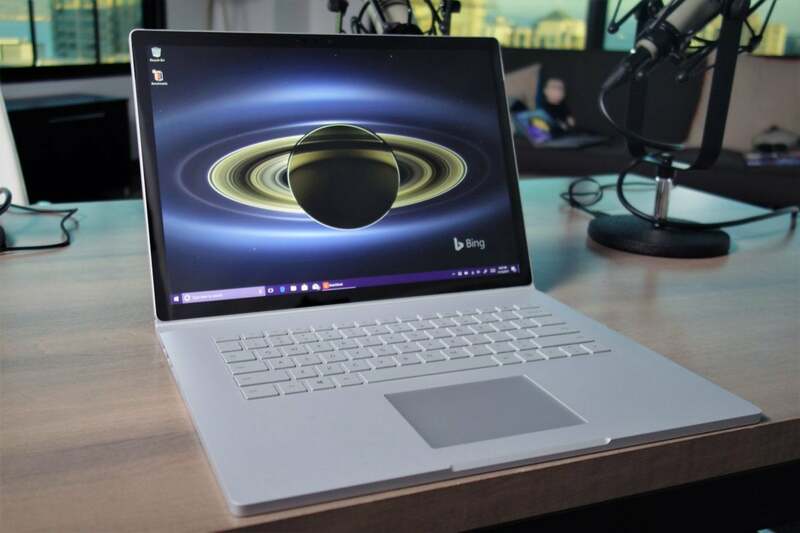 The cheapest Surface Book 2 is priced at $1,499 (with a 10 percent discount for military, students, faculty and even parents of K-12 or higher-ed students). Though it uses a 7th-gen Intel Core i5-7300U with an integrated GPU, the other models will ship with the 8th-gen Core i7-8650U, as shown below. We tested the priciest Surface Book 2 available: the $3,299 (!!) 15-inch model, which ships on December 15. The other SKUs will be available on November 16, Microsoft says. Microsoft has a new digital stylus—what it calls a Next Generation Surface Pen—as well as the Surface Precision Mouse. Neither ships with the Surface Book 2, and neither is required. Our Book 2 shipped with the Windows 10 Creators Update, and not the Fall Creators Update—possibly due to a bug in the FCU that essentially turns off the Pen. Microsoft’s Surface Book has always reminded me somewhat of an answer to Lenovo’s classic ThinkPad, replacing the classic black bento box with a nearly uniform silver slab. Unlike the Surface Pro and the Surface Laptop, there are no color options, and the only adornment is the Windows logo on the outer casing. Raise the display into a laptop configuration, and the keyboard’s backlighting is the only visual cue that the Surface Book 2 is awake and active. As with most Surface devices, the display is one of the selling points of the Surface Book 2. Though Microsoft doesn’t tout the Surface Book 2 as a content-creation machine as it does the Surface Studio, the Book 2 does include both of its color profiles: standard RGB, and its “enhanced” profile, which makes colors a bit more vivid. If you’d like, you can also use the Surface Dial peripheral on the ten-point touchscreen. While docked, the Surface Book 2 reclines to about the same 50-degree angle as the original Book, not nearly flat enough to let the Dial rest without sliding to the ground. While undocked in tablet mode, though, the Surface Dial works fine. 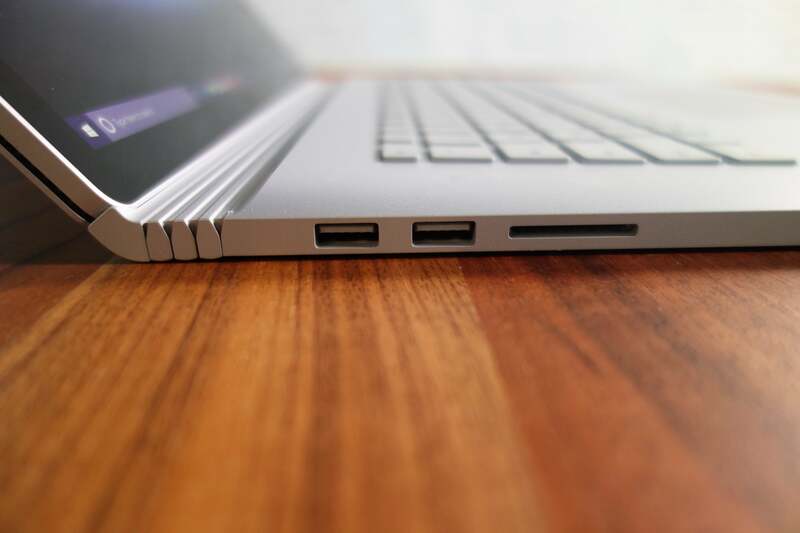 The Surface Book 2, reclined, together with the USB 3.0 ports and the card reader on the left side. The accordion hinge looks very similar to the original Surface Book’s. Though the Surface Book’s weight climbs towards four pounds, the incredibly long battery life means you can leave your charger at home. (If you’re an acolyte of the Microsoft ecosystem, you probably already own a Surface Dock for expansion and charging, anyway.) Still, it’s no wonder why Microsoft’s device chief Panos Panay refers to the Surface Book 2 as essentially a desktop, as the device is big and bulky, though not especially heavy. The Surface Book 2 is a 2-in-1 convertible. Though it lacks the 360-degree hinge of most such models, the display can be flipped over and reattached into a tent mode for viewing videos, or detached to function as a conventional tablet. Press a button on the keyboard, and after a second or two the “muscle wire” retracts, and the tablet disconnects from the base. Microsoft claims the tablet disconnects more quickly than in the previous Surface Book, though in testing both, I couldn’t see much difference. After a second or two, the Surface Book 2 releases the tablet, and you can lift it free. This is no Amazon Kindle, though: Undocked, the 15-inch tablet is almost ludicrously huge, and unless you’re in the NBA, I doubt one hand will have enough breadth to hold it comfortably. By itself, the tablet weighs 1.8 pounds, surprisingly light for something so big, but it’s still awkward. Once detached, it feels like it needs a Surface Pro-like kickstand.The tablet is multi-touch, with the standard ten points of contact. Detached, the Surface Book 2 tablet is large and bulky, though not especially heavy. The silvery metallic exterior of the Surface Book and Surface Book 2 both exude an almost military-like solidity. In a year or so of using the original Surface Book as a daily driver, it became slightly dented in places from normal wear and tear within a sometimes crowded backback, and suffered a larger divot from a Kinect that plunged from the top of my rolltop desk as it lay, closed, on my desk. Neither affected its performance. That’s a good indicator that the Surface Book 2 will be equally durable. The “hinge gap” remains on the Surface Book 2. 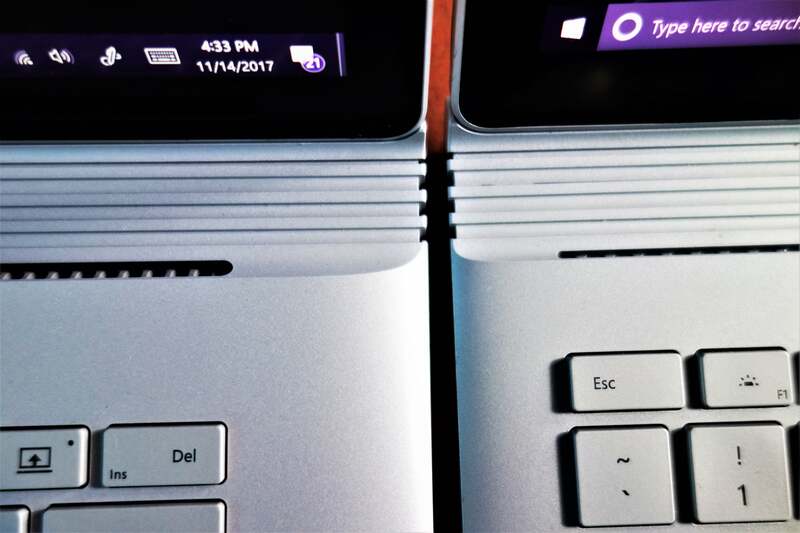 Piling an additional notebook or two on top of the Book never damaged its iconic, accordion “dynamic fulcrum” hinge, which remains within the Surface Book 2. When the Book 2 is closed—now with a more authoritative click—a small gap remains near the hinge. While that space may still be oddly frustrating to some, it doesn’t affect performance and seems as structurally rigid as before. The tablet does wobble when you jiggle the base, though not as much as with the original Surface Book. It’s a reminder, though, that this isn’t a true notebook. 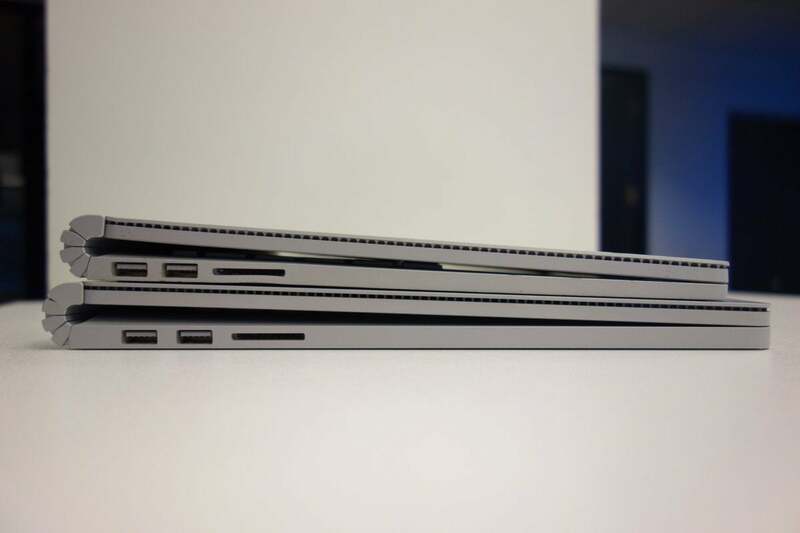 The Surface Book 2 (left) has a larger vent than the original Book (right), which may explain the quieter fan sound. Still, these are the only vents on either device. Perhaps the most surprising thing about the Surface Book 2, though, is simply how quiet it is. Microsoft uses a passive cooling system to cool the clipboard or tablet portion of the Surface Book 2, forgoing the fan entirely. Yes, it’s a fanless Core i7! There's one area where the Surface Book 2 falls short. Keep reading to find out how. Microsoft adds to its "ultimate laptop," the Surface Book 2, by increasing the performance, battery life, and display size.